I’ve previously mentioned that hearing live Simple Minds bootlegs around a dozen years ago were a major factor in ramping up my Simple Minds fandom from diligence to [some would say] obsession. My antipathy for the first official live album has been noted. I could harbor no such feelings toward the “5×5 Live” boxed set. I’d like to say that it is a fan dream realized, but in truth, I never had the chutzpah to dream so boldly as this. Quite simply, it’s a single package that wraps a neatly tied bow around the band’s preferable artistic legacy while honoring their potency, even contemporaneously, as a live force to be reckoned with. Disc one opens with an overture piece called intro, which was played before they took to the stage. Instrumental riffs from their early material were woven into a medley which was, initially, available as a free download for members of simpleminds.com. The audience feedback when the opening riff to “Theme For Great Cities” figures in the mix goes wild with enthusiasm. One would think that they had just heard a song that had gotten to number one in the charts at some point by their fervor. Watching that driving instrumental obtain classic status is probably down to it being an Ibiza favorite, but it’s nonetheless encouraging to see what was once the B-side to their first chart hit regarded as a classic for any reason. Then the band are on stage and the album cuts right to the heart of the matter with a four song suite taken from “Empires + Dance.” Of course, the actual recordings are from the full breadth of the tour. The sequencing of these four songs sets the tone that this was to be a singular experience, and that it was this music, that had ultimately cast a shadow that allowed it to compete over time with the records that sold in far more numerous amounts. Reviewing the setlists reveals, that by the middle of the tour, the first four songs played had settled into the order that was also on disc one. They kicked off the show with “I Travel,” which actually was the set opener for every show. I was lucky enough to have caught the song on the “Floating World Tour” in 2002, and the track has spent a long stretch being a go to part of their classic portfolio that has a 50-50 chance to figure in almost any set list, but that doesn’t mean that it’s not still one of the most exciting Post-Punk songs I can name. Familiarity has not bred contempt. The middle eight featured a sleek drop where the song fell away to give the Moroderesque sequencer prominence for a few bars while Mel Gaynor gives with the drum fills. It was a good opener, but track two really goes places. “30 Frames A Second” has long been a favorite track from “Empires + Dance.” The motorik backbeat throughout the song, sets the exactly right tone of dislocation/alienation for the song. Andy Gillespie’s synth leads are chorused allowing the queasy, minor key riffs to be echoed by Charlie Burchill’s guitar leads. This has always been a powerful song, but the album version was segued with “Room” the next track. What had been done to the arrangement here to effect a cold ending is nothing less than spectacular. As the song entered its climax, Gillespie’s leads swelled in intensity in the mix, sounding more foreboding than ever. Simultaneously, Burchill introduced tension building slow, reverse pick scrapes and inverted whammy bar riffs that profoundly heightened the sense of vertigo always inherent in the song, but never as fully realized as it was here. The music actually sounds as if it’s tearing itself apart, moving in opposite directions, until the final crashing chords dramatically end the song, making for a spine-tingling moment. Every time that I hear this recording, and I’ve heard it dozens of times now, there has been no ebbing of its impact. I went back and listened to earlier recordings of this song by the 32 year younger, original band and I must say that none of these hold a candle to what they have done here. This is a best of breed live recording that now makes the album version sound wanting. Most impressive for a group that’s been going for over 30 years. After “Today I Died Again” and the motorik bounce of “Celebrate,” it’s almost jarring to hear the band’s debut single, “Life In A Day.” The stylistic gulf between it and their masterful third album is vast, but the liveliness of the song gives their New Wave origins a fair hearing. The percussion that Mel Gaynor employs here pops from the speakers like nothing I’ve ever heard from this band. Next with “Calling Your Name,” the band dips their toes in the “difficult” sophomore album for the first time. “Scar” follows with its seductive, yet sinister, melody. It’s a real treat to hear this live. Apart from the sturdy “Premonition,” I can’t say that I’ve ever heard much from “Real To Real Cacophony” live, so the inclusion of five tracks here, was pretty much a first time event for me. Next, a precise version of the arid “King Is White And In The Crowd” followed. Ged Grimes played the fretless well here, and the slinking funk undercurrents of the song contrast beautifully with the metronomic rhythm box foundations of the song. “Hunter + The Hunted,” also from “New Gold Dream” followed. This was a track that like “I Travel,” was fairly common in their set lists but hearing it juxtaposed against all earlier material and nothing younger than 30 years is by far a better context than it’s had in long years. The joy of this album is that the material carries no regrets when I listen to it. There are no compromises here. It’s a return to the innocence of the time when Simple Minds were one of the best bands on the planet, and there was not yet reasons to doubt that conclusion. The audience singalong that concludes “Wasteland” from “Life In A Day” came a something of a surprise. It’s a great cut with a distinctive galloping guitar riff from Burchill that I wouldn’t have thought was a s popular as it seemed here. “Love Song” followed and the “Sons/Sister” genie was finally out of the bottle with one of the perennial classics not far from any of their set lists. Ged Grimes on bass does his best to give the sometimes stentorian song a fluid funk underpinning that adds swing to its bones. The song live is always pure excitement, especially as it reaches its crescendo with the massive chord that herald the climax of the song. But the excitement is only getting underway with this album as disc one moves to some dramatically conclusive material. The track that really popped when I first listened to this album and made me hear the song in a new light was for the widescreen paranoia of “This Fear Of Gods.” The massive trance rhythms that are the song’s foundation are abetted by primeval shaker percussion from Gaynor that reacts viscerally against the stately synth patches that Andy Gillespie employs here. The disturbing, distorted sax of Burchill in the song’s beginning stands as a reminder that it took years for him to get hemmed into a guitar hero corner. The end result was a simply massive excursion into the heart of darkness at the core of “Empires + Dance.” The results are breathtaking. Has pop music ever been this powerful and affecting? After the conclusion of this intense number, the unease is ratcheted up a few notches further with the centerpiece of their debut album, “Pleasantly Disturbed.” Charlie Burchill even broke out the violin for this track, just like the old days. When Burchill’s heavily tremoloed guitar gets forward impetus from the quickening rhythms of Gaynor’s drums, it still serves to propel all of the “movements” of the song. It still unfolds like a puzzle box with dread, unease, and triumph existing cheek by jowl in the song’s nearly seven minute timing. Capping disc one is a massively extended arrangement of “Room” from “Empires + Dance” that ventures into new parts of the floor plan in its new form. The brief coda of “Empires + Dance” has been doubled in length without it ever becoming a medley with Lou Reed’s “Rock + Roll” as it had during the song’s heyday. The bridge features the siren guitar riff from “Changeling” now juxtaposed into this number from the next album. Again, it’s impressive work, but it’s only half over. 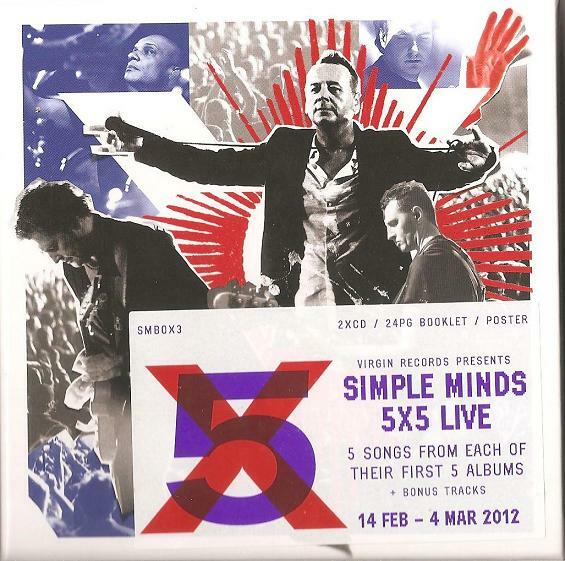 This entry was posted in Core Collection, Rock GPA, Scots Rock and tagged 2012, 5x5 Live, live album, Rock GPA, Simple Minds. Bookmark the permalink. When I first heard about the 5X5 tour, I questioned (on the Trouser Press board) whether or not they could pull it off. Well, one listen to 5X5 Live on Spotify and my question was answered. Everything sounds great and is played with youthful gusto. The two surprises for me were “Scar” and “This Fear of Gods.” The former is a perfect example of Burchill’s class…such beautiful, tasteful, riffs that accent the keyboards. The latter, on the other hand, is such a monumental, huge song, with a beat that is more than just a beat, but a driving force. Like “Thirty Frames a Second” blows away the studio version, so does this. In the live setting, it simply explodes. My only complaint is that IMO, the “Life in a Day” material is not only weaker, but so substantially different in style that it doesn’t really fit with the rest of the songs (except “Pleasantly Disturbed”). I will admit to skipping those tunes now when I get to them. While I agree that the Life In A Day work is substantially different, it is the root from which the wild vines of Simple Minds’ Imperial Period grow. Coming out of Punk and Art Rock and hinting, here and there that they were listening to what else was going on, it validated the inclusion of that music for me. 5×5 Live is just a very special thing for me – a listenable, essential live collection.